Australia Post has partnered with Shazam’s m-commerce solution and Adshel bus shelters in two Australian cities to promote its Load&Go gift cards for Christmas. 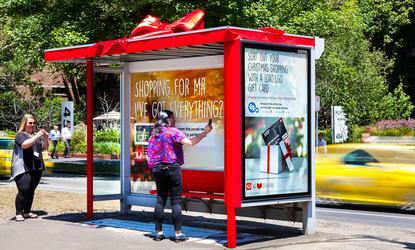 The campaign sees Australia Post ‘gift-wrap’ selected Adshel bus shelters in Melbourne and Brisbane, and encourages consumers to directly purchase the gift card by ‘Shazaming’ the ad through the in-app camera on their mobile phone. Doing so takes the consumer to an Australia Post online page where they can complete the purchase. The campaign represents a partnership between Australia Post, Dentsu Mitchell, Adshel, GPY&R and Shazam. “It is great to see an idea come to life so relevant for consumer needs at this time of year, and enabled by innovation that makes interaction and fulfilment easy,” said managing director of Australia Post's out-of-home specialist Posterscope, Joe Copley. The campaign is appearing on outdoor panels until 13 December.